My car died today. Not physically, but emotionally. This car is dead to me now. I initially bought a Miata, because I wanted to have fun. I’d always wanted a Miata. The lightweight chassis, and high-revving engine was always an appeal to me. Everyone I’ve seen has always had fun in one. So this February, I bought one. It was a very happy day! I’d finally purchased one of the cars that’s on my ‘list’, as one car I had to have before I died. Since then, I haven’t really had much fun with this car. It’s not fun. Frankly, owning this Miata has sucked! It’s just more of a burden, than the escape that I had planned. Why though? Since I’ve bought the car, here is a brief summary of my Miata mis-adventures. Softtop was vandalized and they tore the glass in the backroof. Various parts are just found to be missing, like the front undertray, heatshielding, etc. At first, some of these small problems were amusing. None of them were debilitating, and were pretty simple to fix. I didn’t like the money that I was spending, but I was learning something about my car. However recently, I’ve just gotten fed up with it. Every week, I’ve had some issue. Each event I’ve attempted to go to, I haven’t had any fun. It’s left me stranded more time than I’d like to count. Really, I’m not having any fun owning this car. As as a car person, that’s a problem. I can’t have a car that I hate. This is definately not the business. I don’t have the money to just get a new car right away, (Frankly, because I’ve spent it trying to get my current car running. ), but maybe I should try to find a new and different one. Miata engines are supposed to be inexpensive, so maybe I should try to find a new motor. With a new motor in the car, I could take the time to put some nice fancy bits on it, if I wanted. I’m torn in a few different directions on what I should do. What do you guys think? I put a poll below to get your opinion on it. This entry was posted in Daily Driver Projects. Bookmark the permalink. I would probably vote new engine if you can do it cost effectively. You have heard my opinion on megasquirt before – it hasn’t changed, I wouldn’t use it on my lawnmower. (fuel injected lawn mowers though, that’s quite the thought!) Look into the AEM EMS-4, twice the power for the same cost (just not as many injector/ignition outputs but for a Miata you’ll be fine). i just picked up a ’90 1.6 my self. looking forward to having a blast with it. i vote replacing the engine, i’ve heard them go for between 500-1000 up here. they might even be cheaper. If you plan to track this car or even do any spirited driving. Engine swap would be the best route to go. If you don’t’ fix the head gasket, that engine is going to BLOW! However, you have to consider if you are going to do the swap yourself or take it to the shop? if you plan to have a shop do it, might as well use that money to buy a another car, unless you know a garage mechanic who charges cheap. 1. Do you have the major tools? Good set of sockets and wrenches, engine hoist and also specialty tools like a pilot bearing puller, clutch alignment tool, etc.? Most of these can be loaned out from your local parts store. 2. If it’s a manual, this would be a great time to replace the clutch. Maybe an upgrade? + light weight flywheel? Or even just a stock replacement is something to consider. 3. Once the engine is out, this is a great time to inspect the engine bay for stuff or even clean it out. There are so many things you can’t see because the engine is in the way. 4. If you are getting a JDM engine replacement, you may need to remove and replace the smog components from your old engine and maybe even the manifolds? 5. Consider the cost of all the misc parts that you SHOULD replace with this new used engine ie. spark plugs, water pump, gaskets, or seals. Those are just some things to consider when doing a swap. Another benefit of a swap is, only because your current engine isn’t’ crap yet, you will have a extra engine to play with. Send that sucker off to Flyin’ Miata and have them build it up to handle TURBO! New engine. Being a ’93, you don’t have to worry about OBD2 shenanigans. I suggest a 99+ engine, followed by a MegaSquirt to run it properly. You then have a great base upon which to build a turbocharged track terror. Resistance is futile. 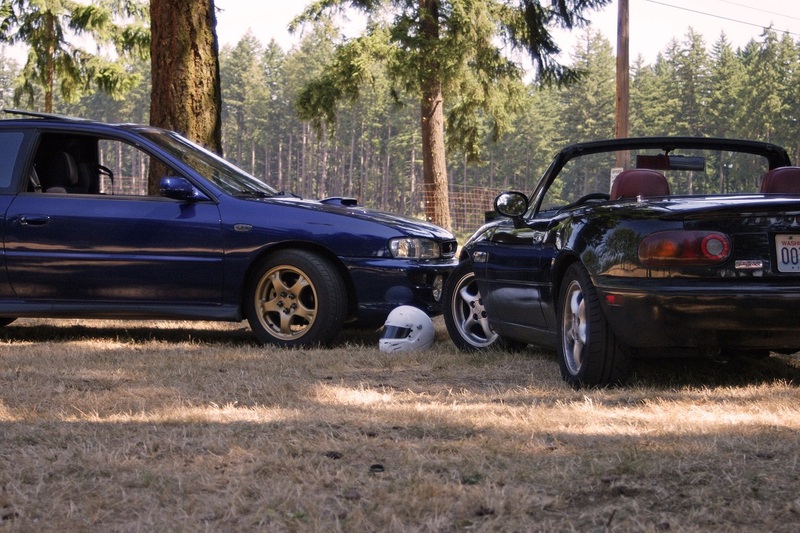 Keep the Miata! Haha. I can’t argue with that logic, Bret. 🙂 Also, if I get a new engine, that gives me an excuse to get a new ECU. I really don’t like having that California-only setup right now.